Protein structure is nearly always more conserved than sequence. As a result, when two proteins share a significant sequence similarity, it is extremely likely they will also share similar 3D structure. The following instructions demonstrate how to find significant CATH structural domain matches on your own protein sequence. Go to "search by sequence"
CATH-Gene3D provides information on the evolutionary relationships of protein domains through sequence, structure and functional annotation data. The homologous superfamily (H) level of the CATH hierarchical classification groups domains that are related by evolution (find out more about the classification process). A relatively small number of CATH superfamilies have developed high levels of sequence, structural and functional diversity during evolution. Despite high levels of structural diversity, these superfamily members are still observed to share a conserved structural core. Superfamily relatives are clustered at different degrees of domain sequence similarity: 35, 60, 95 and 100%. Superfamilies are typically described as being diverse in sequence if they have multiple clusters at a sequence identity of 35%. The Classification / Domains tab on the CATH superfamily web pages provides an interactive diagram for exploring all the different types of sequence clusters. Structural diversity in a superfamily can be measured by looking at the number of structurally-similar groups (or SSGs) that it contains. The Superfamily Superpositions tab on the CATH-Gene3D superfamily web pages demonstrate that even structurally diverse superfamilies have a common structural core. Superfamily relatives with similar sequence properties are clustered into functional families (or FunFams). The FunFams are useful in the prediction of function and in providing information on the evolution of function. Proteins are typically composed of one or more building blocks, called domains. Protein domains are generally considered as independently-folding units of structure. Within a superfamily, CATH-Gene3D creates Functional Families (FunFams) that aim to group together domains that share the same function. Therefore, if a region of protein sequence provides a highly significant match to a particular CATH-Gene3D FunFam, then there is a good chance they shares a similar function. To test this assertion, our function prediction pipeline (based on these FunFams) was submitted to the Critical Assessment of protein Function Annotation (CAFA). Our method was ranked highly for accuracy of function prediction according to a number of different scoring methods. The following instructions demonstrate how to find function annotations for your own protein sequence. Go the "search by sequence" page. 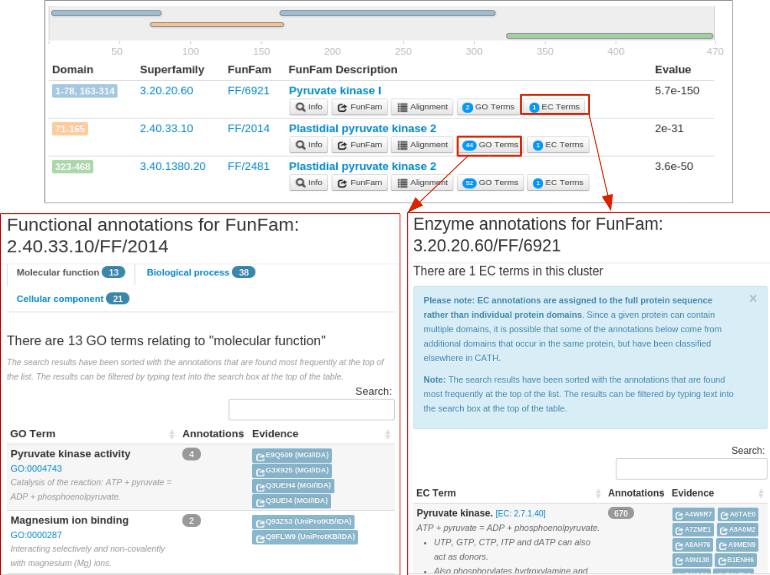 The Enzyme Commission (EC) and Gene Ontology (GO) annotations for the matching FunFam(s). Protein domain superfamilies in CATH-Gene3D have been subclassified into functional families (or FunFams), which are groups of protein sequences and structures with a high probability of sharing the same function(s). Therefore, the functionally important residues in a family are also expected to be highly conserved. Information on conserved positions in CATH-Gene3D FunFam alignments is shown through the Alignment tab of the FunFam webpages. Conservation scores have been calculated using Scorecons and columns in the alignment are coloured using a rainbow colour scheme, where the highly conserved residues are shown in red through to positions that are not conserved at all, shown in blue. The conservation scores are also mapped onto a representative protein domain structure. To investigate putative conserved sites for your protein sequence, run a sequence search against the FunFams and click on the FunFam match Alignment page. Core classification files for the latest version of CATH-Plus (v4.2) are now available to download. Daily updates of our very latest classifications are also available. 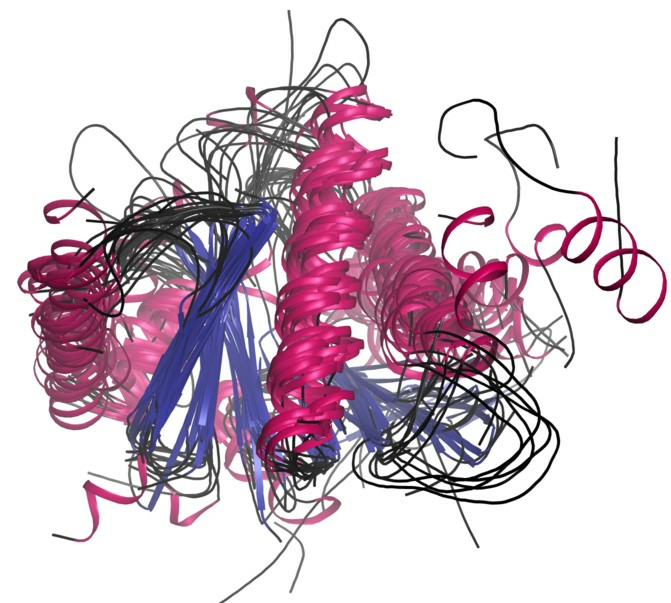 CATH is a classification of protein structures downloaded from the Protein Data Bank. We group protein domains into superfamilies when there is sufficient evidence they have diverged from a common ancestor. Gene3D uses the information in CATH to predict the locations of structural domains on millions of protein sequences available in public databases. This allows us to include additional annotations to the CATH-Gene3D database such as functional information and active site residues. If you have any questions, comments or suggestions please get in touch via Twitter, ask a question in our online forum or visit our support page. CATH: an expanded resource to predict protein function through structure and sequence. Dawson NL, Lewis TE, Das S, Lees JG, Lee D, Ashford P, Orengo CA, Sillitoe I.
Gene3D: Extensive prediction of globular domains in proteins. Lewis TE, Sillitoe I, Dawson N, Lam SD, Clarke T, Orengo CA, Lees JG. The CATH and Gene3D resources have enjoyed generous funding from a number of research councils.